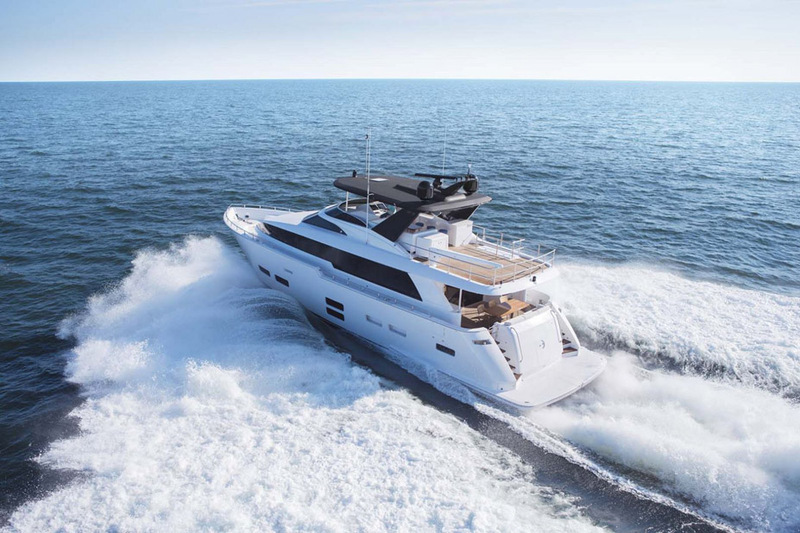 The Mediterranean inspired Hatteras M75 Panacera is a statement from the North Carolina factory in style and performance, while also displaying their commitment to building a quality motor yacht that can rival any European shipyard. 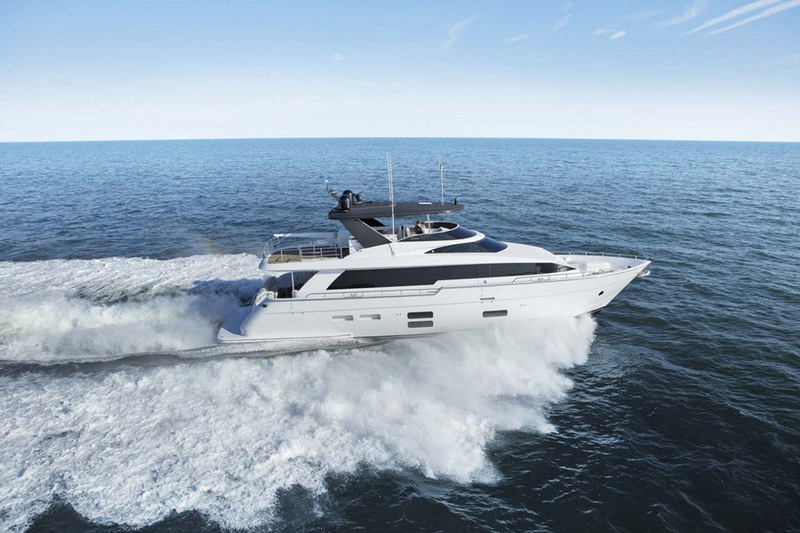 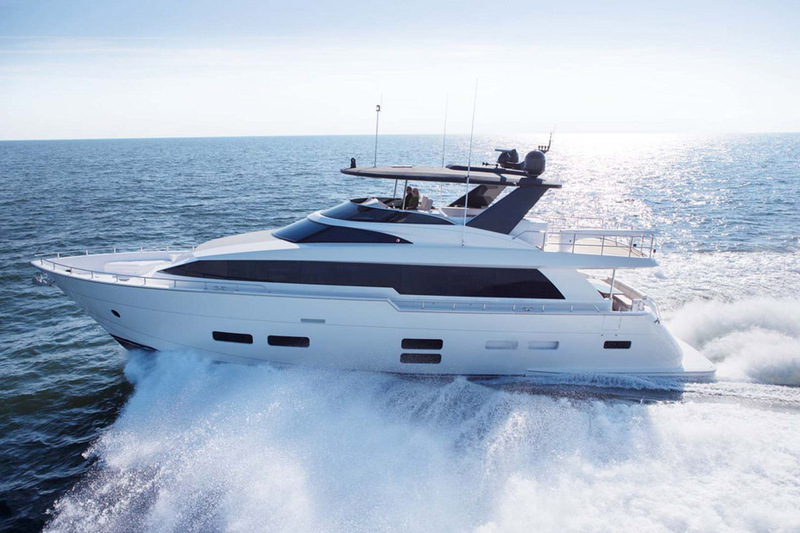 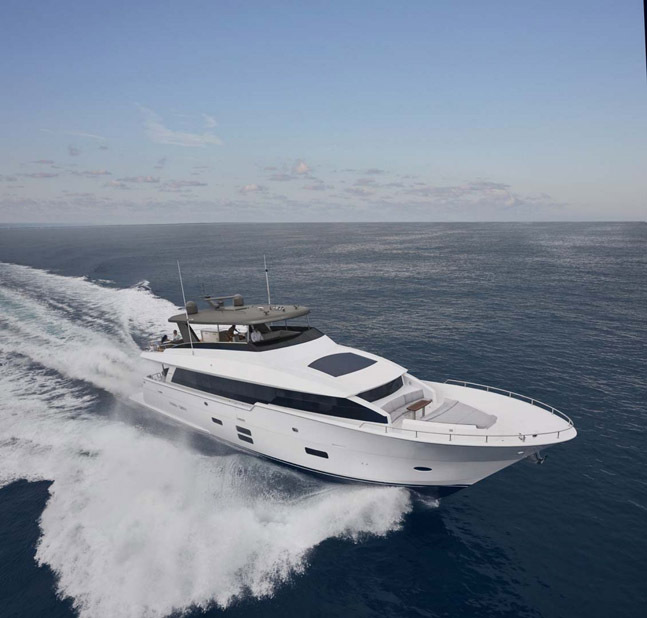 The M75 Panacera was designed off of the successful Hatteras 100 Raised Pilothouse Motor Yacht so many of the same attributes have been carried over resulting in a sophisticated style with an open deckhouse that you would see on much larger yachts. 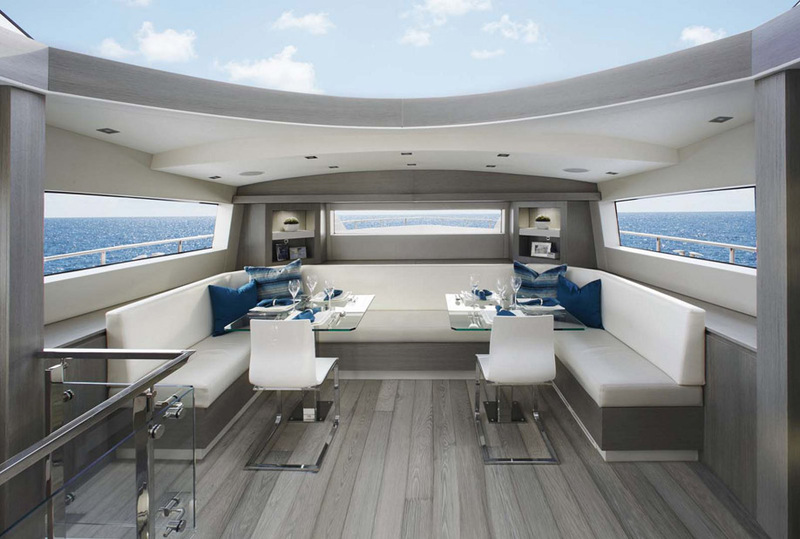 The beam on the M75 is 21-feet which makes a big difference all across the boat from the size of the aft deck to the space in the salon.  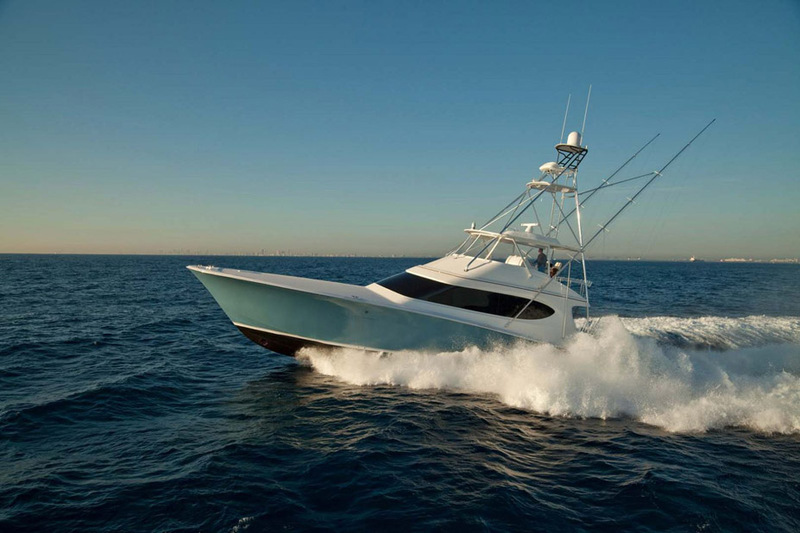 The extra bream also provides for a more stable ride as it spreads her displacement out over a larger area of the boat also giving her a shallower draft. 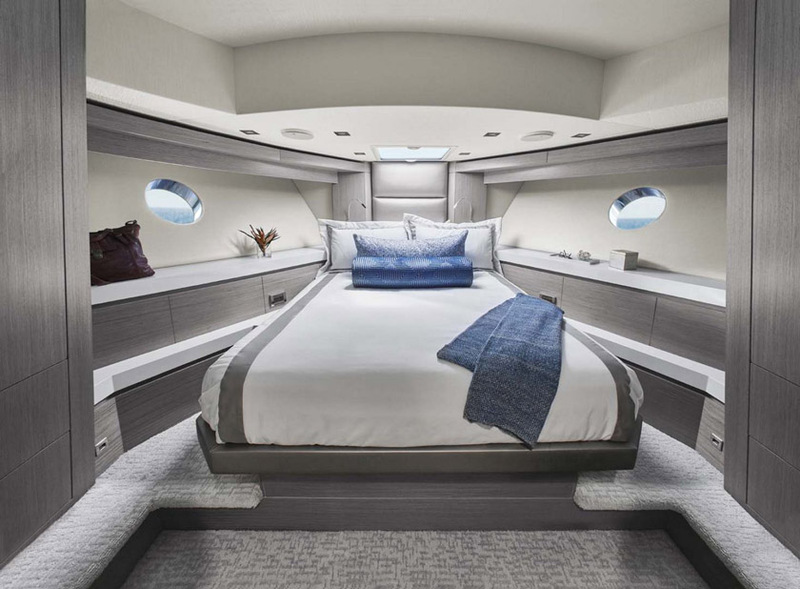 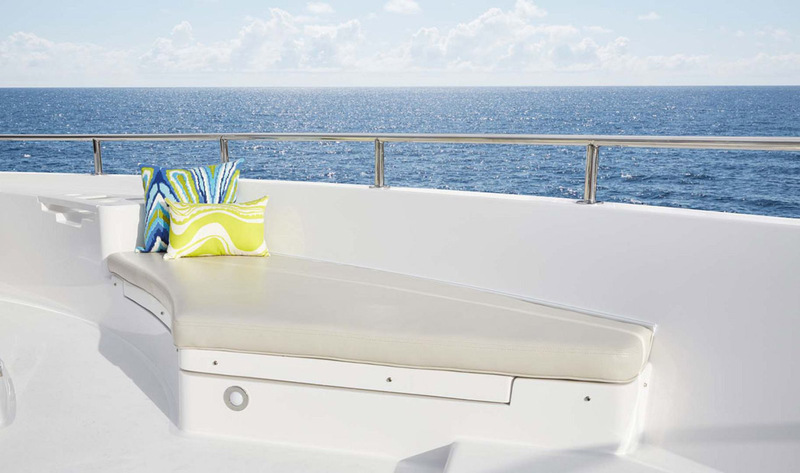 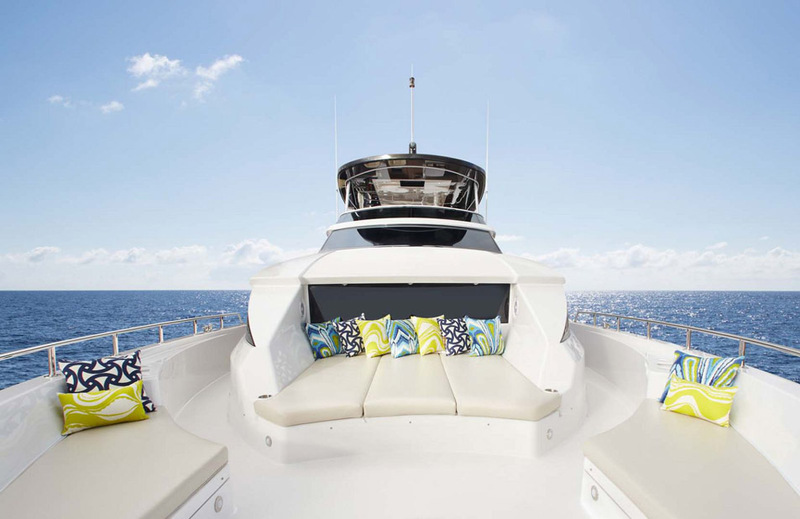 Perhaps the place on board that draws the most allure is the flybridge aboard the Hatteras M75 which lives up to expectations with the wrap-around views and dining arrangements. 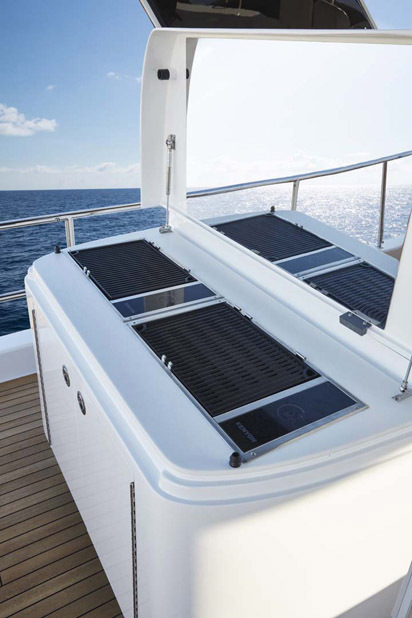 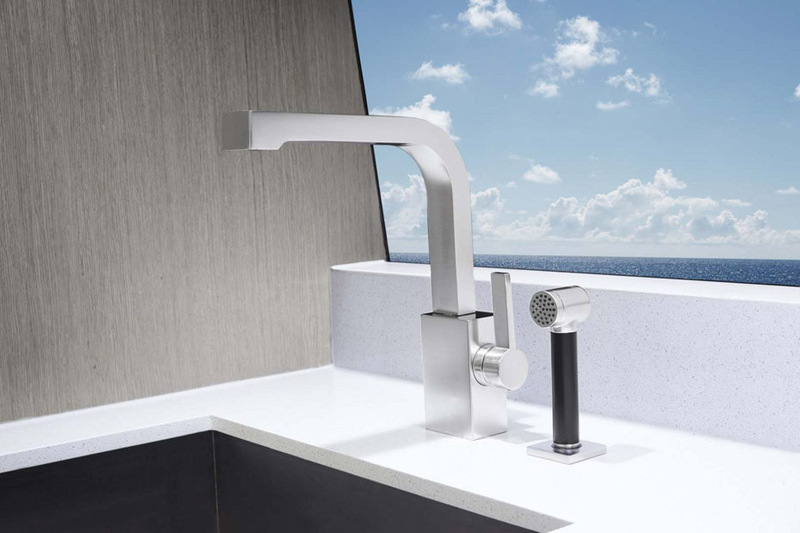 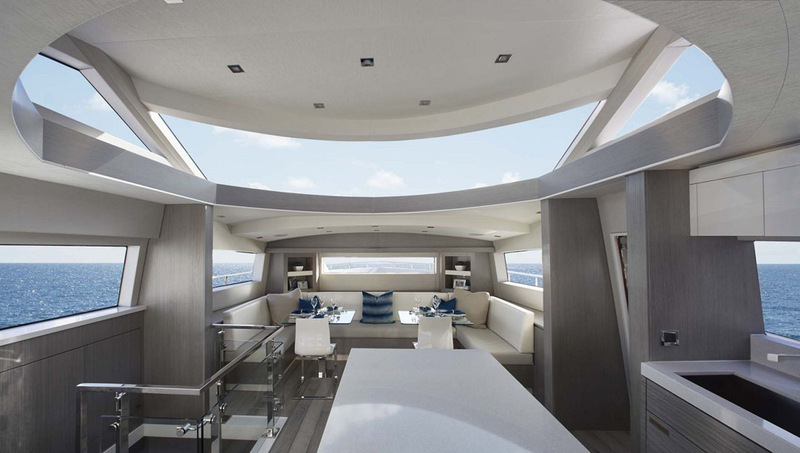 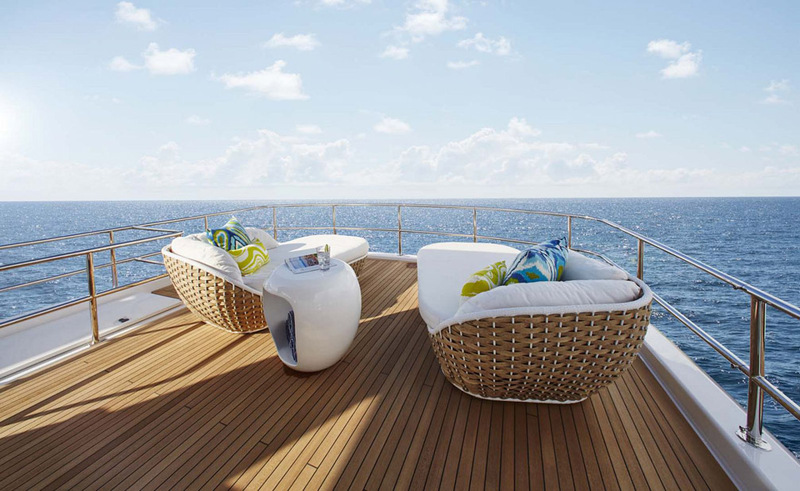 The bridge stretches almost the entire length of the yacht which provides plenty of extra space for grilling, sunbathing or walking around without being crowded. 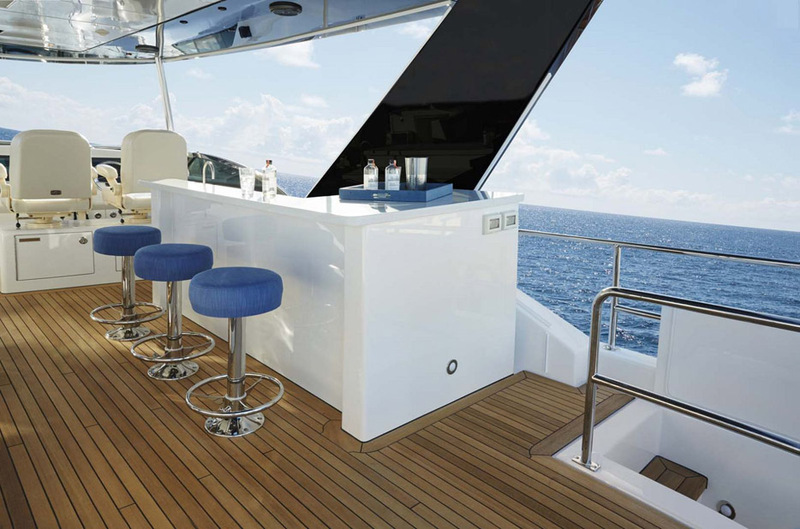 The wet bar with three stools also has a refrigerator, ice maker, and lots of storage space nearby and the U-shaped lounge with teak table gives everyone lots of seating. 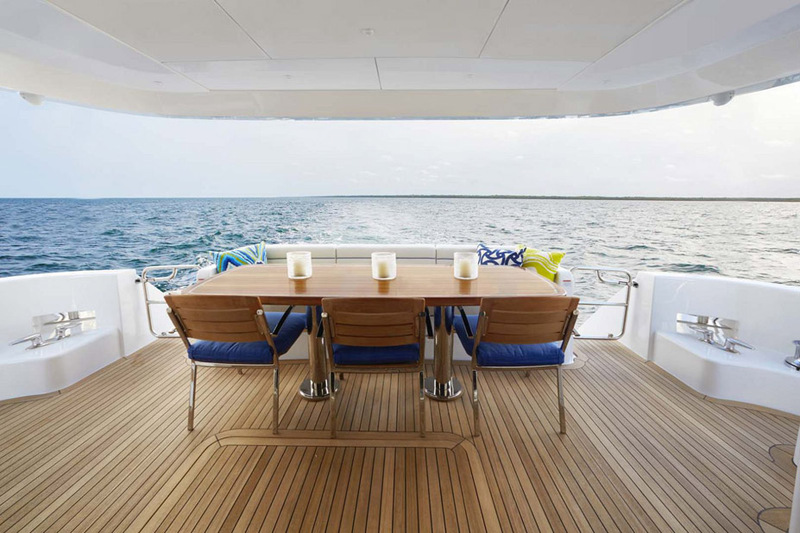 And if the wind isn’t allowing for a peaceful dining experience on the bridge, the aft deck offers a great space for relaxing. 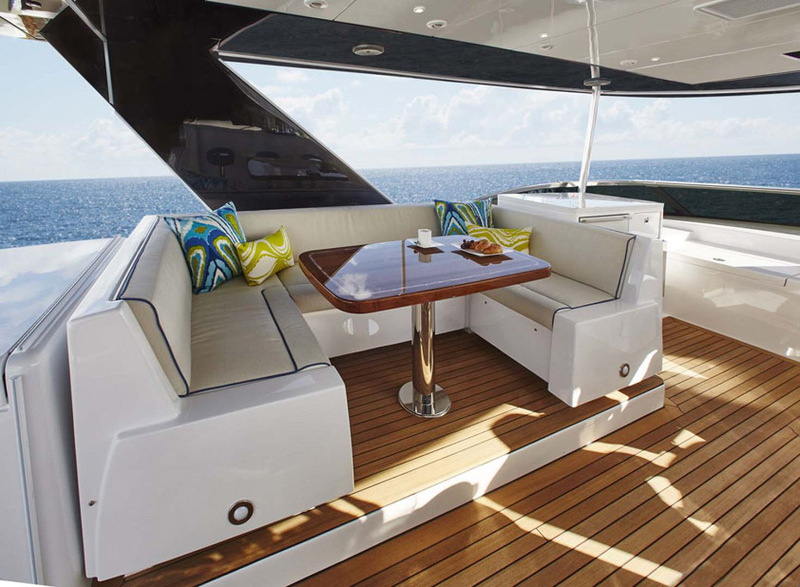 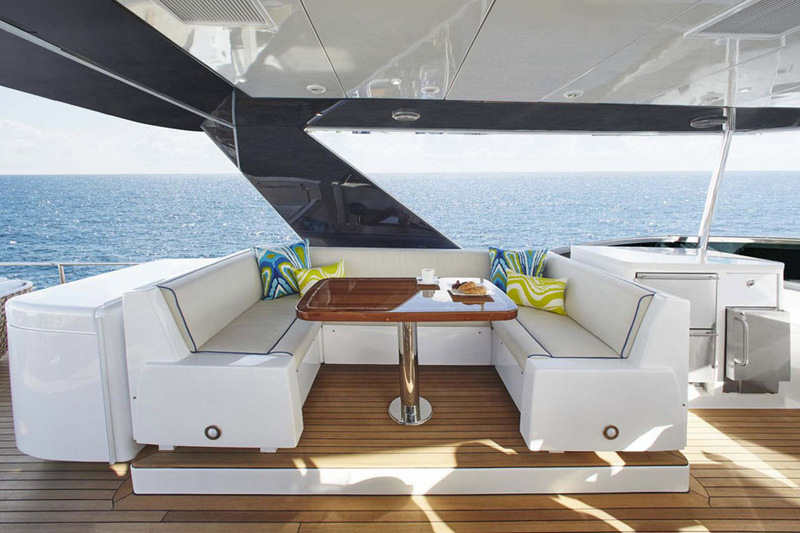 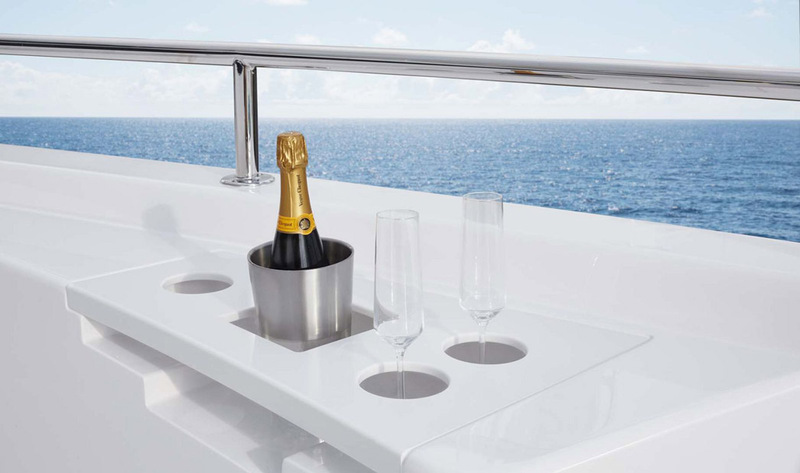 A large teak table with bench seating on the transom is protected from weather and there is a refrigerator in the bar on the aft deck making dining convenient. 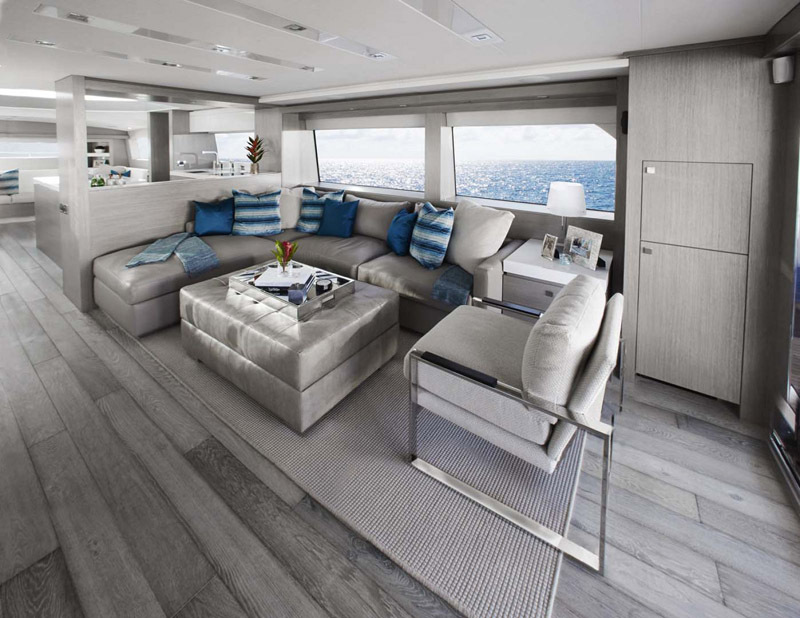 The salon on the M75 is spacious and open with plenty of natural light coming from panoramic windows. 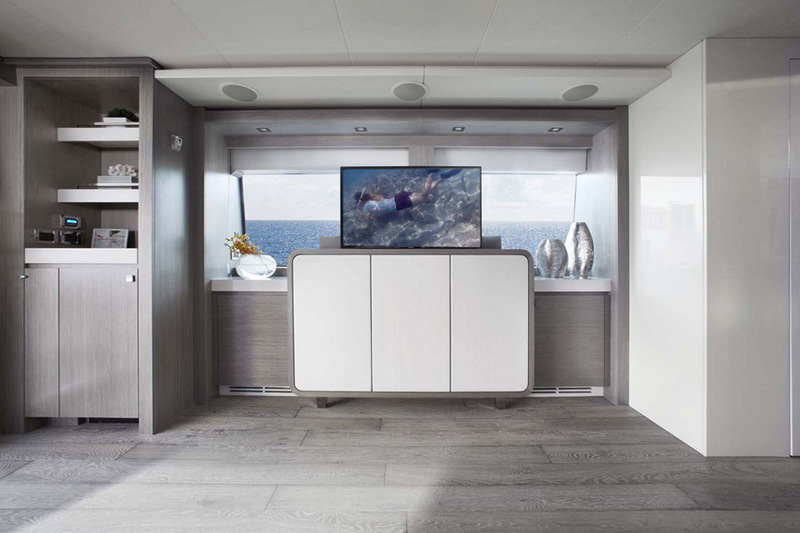 The entertainment center in the salon hides a 40-inch flatscreen television when not in use and also contains a storage cabinet for home theatre equipment. 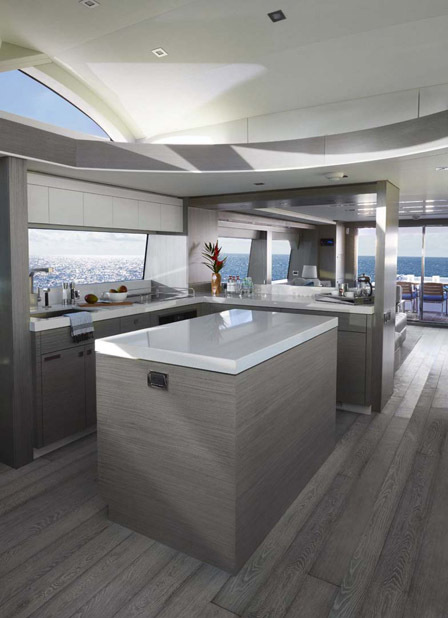 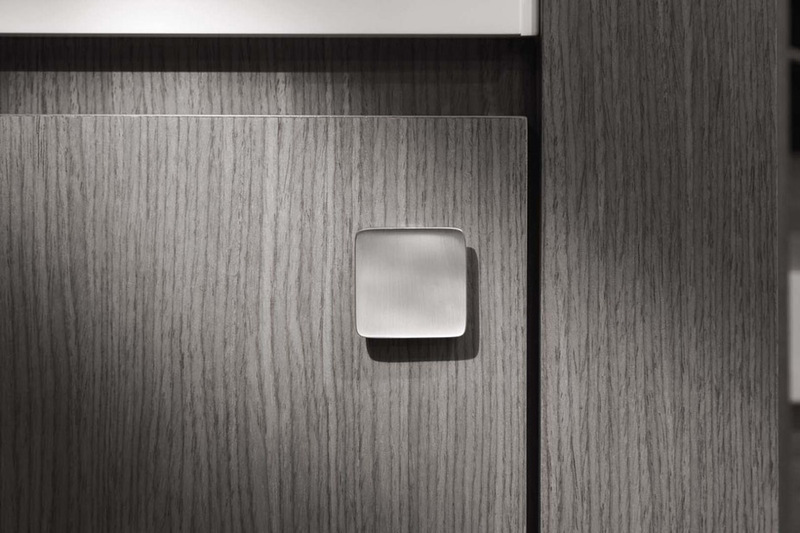 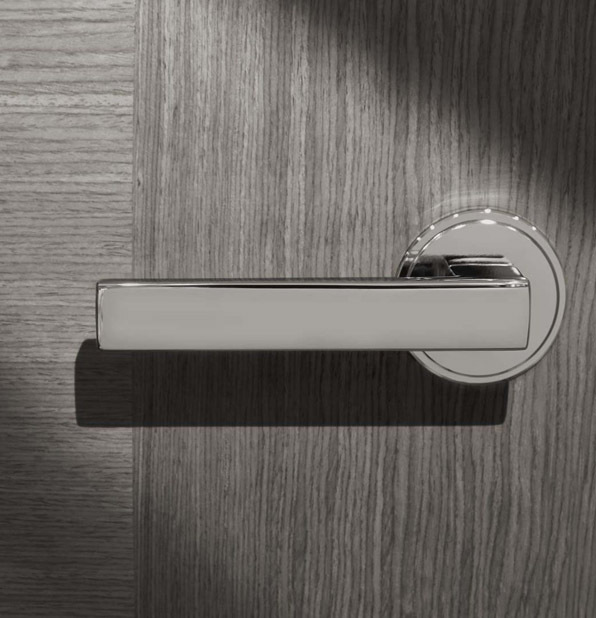 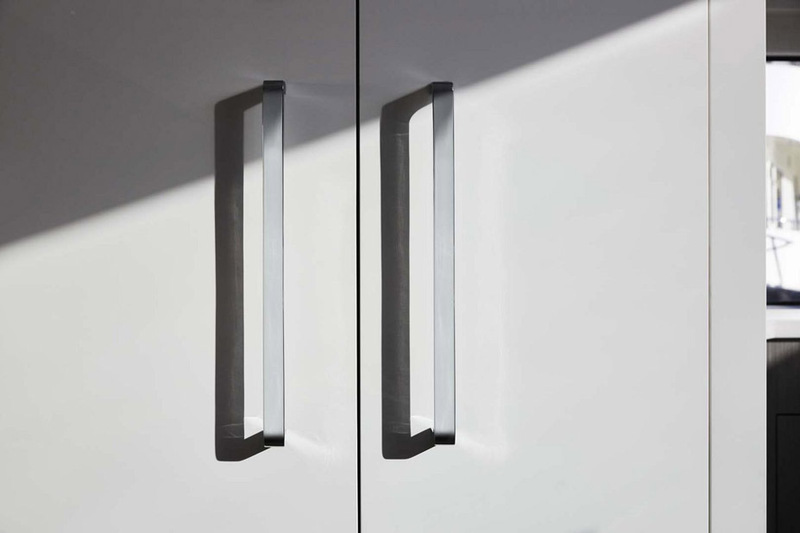 It also comes equipped with a hidden liquor and crystal cabinet that is adjacent to an ice maker. 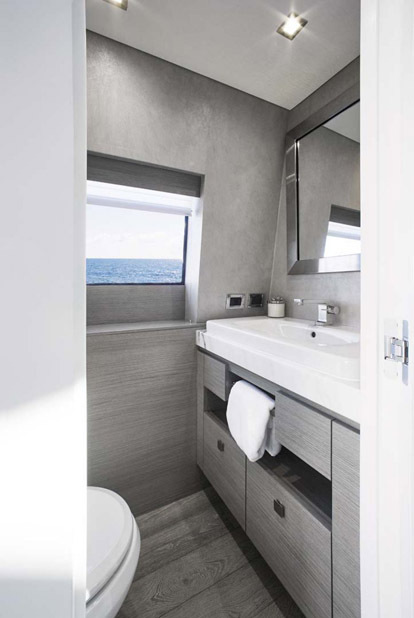 For the owner that wants to bring guests on extended trips aboard the Hatteras M75, the accommodations will not disappoint. 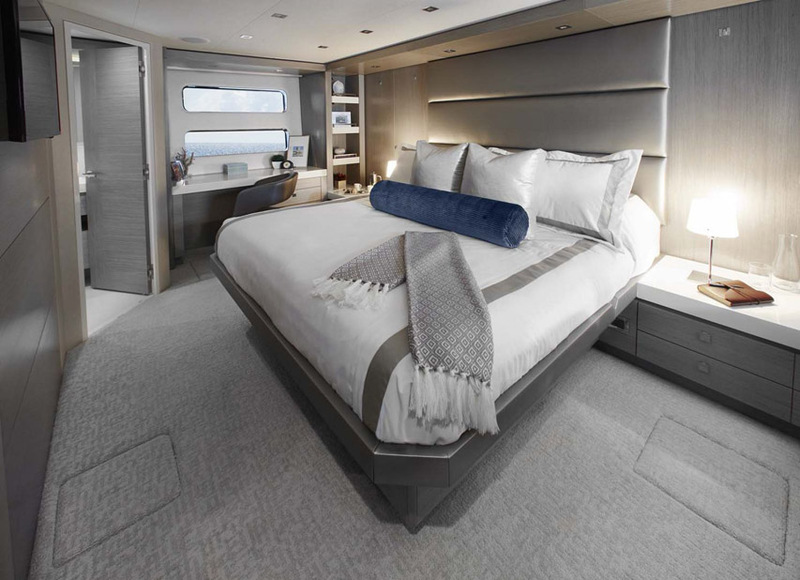 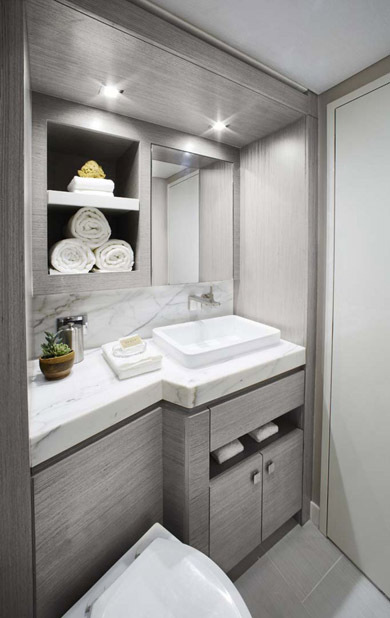 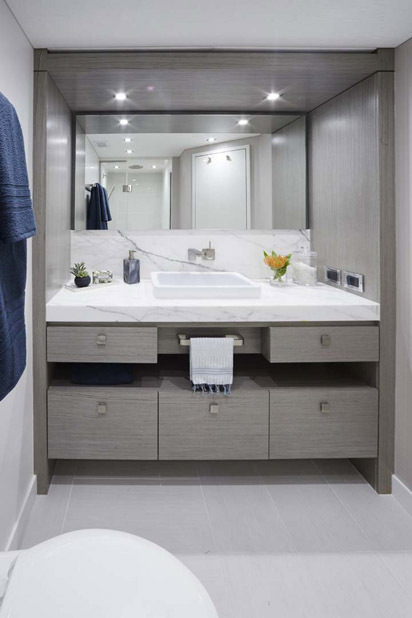 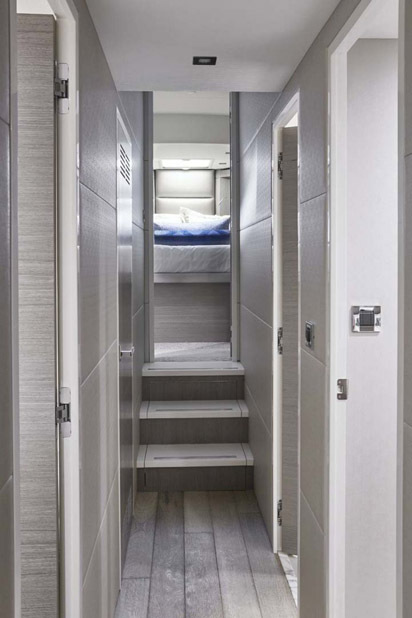 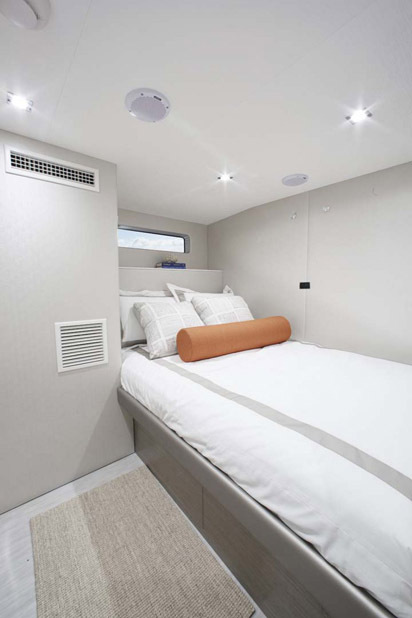 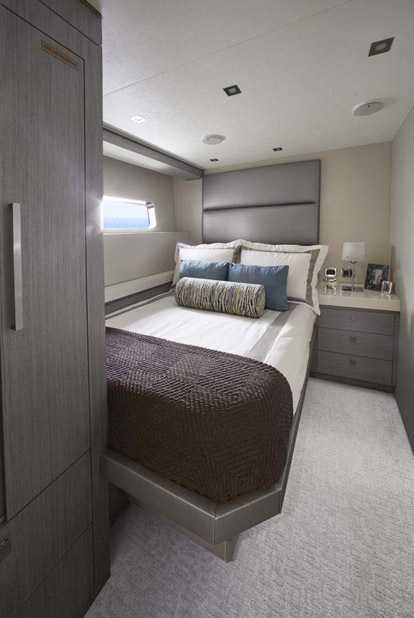 The standard layout on the M75 Panacera offers a full-beam master stateroom that sits amidships and boasts a king-size walkaround berth along with lots of storage underneath the mattress and in hanging lockers, all cedar-lined. 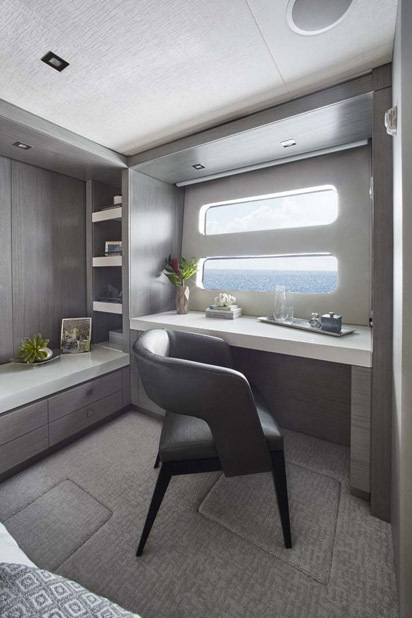 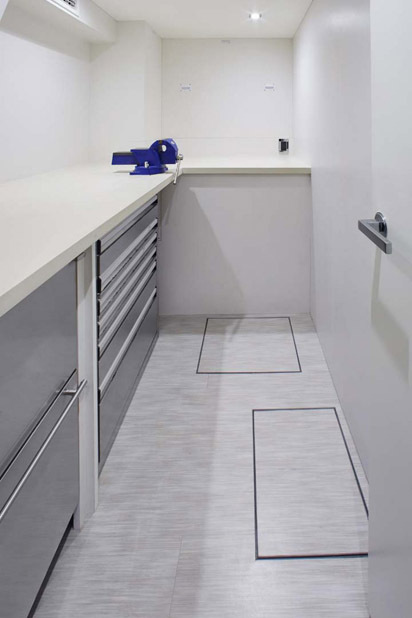 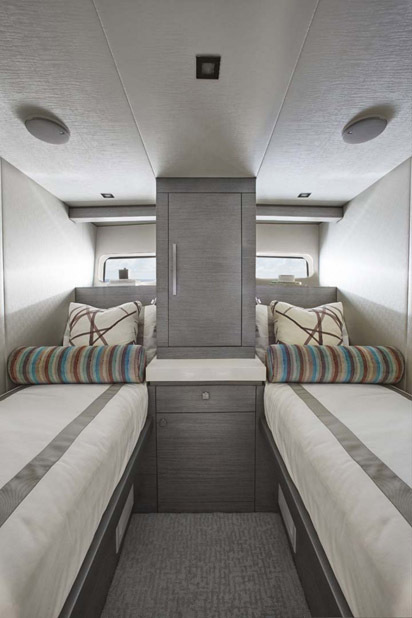 While the standard layout on the M75 provides for a desk, dressers and drawers on the port side of the master suite, this can also be customized to include more couches, more storage, or an open area for large chairs. 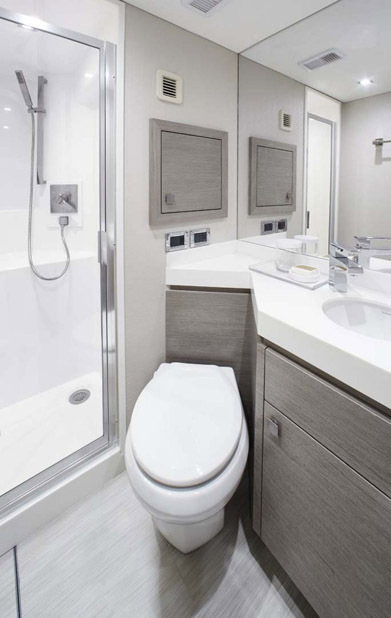 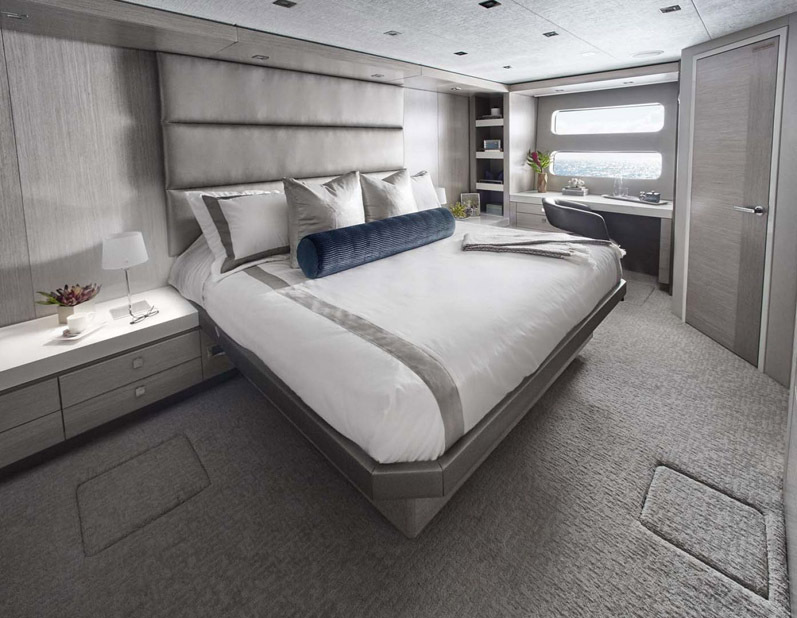 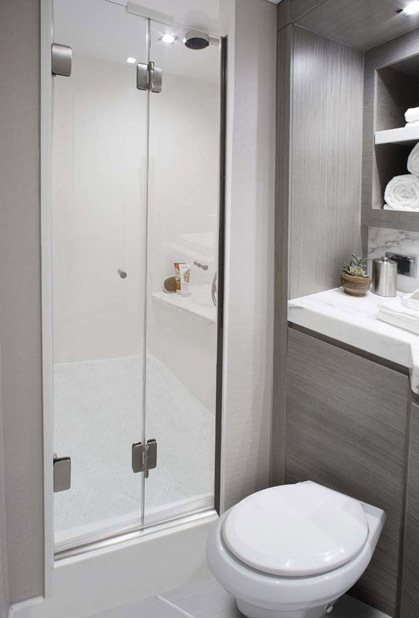 The M75 additionally has the VIP stateroom with a queen-sized berth and its own private head along with two other twin staterooms. 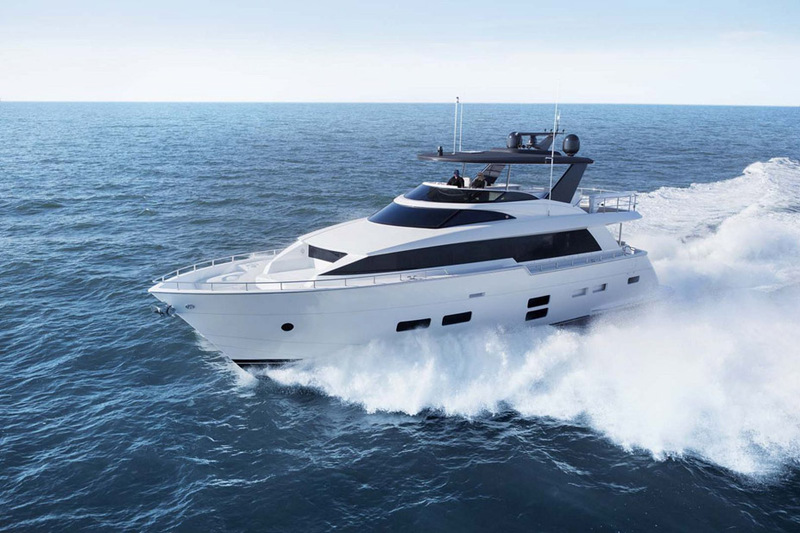 Standard power on the M75 are the twin Cat-32A 1622hp diesel engines, yet owners can choose to upgrade to MTU 2000 12V 1800hp engines which adds enough speed to hit over 28 knots while burning 170 gallons per hour. 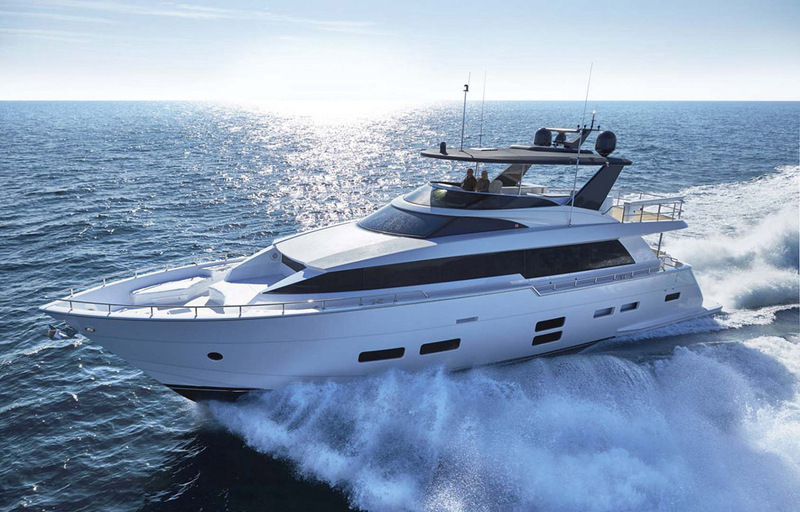 Owners can expect to cruise with the upgrade engines at around 18 knots. 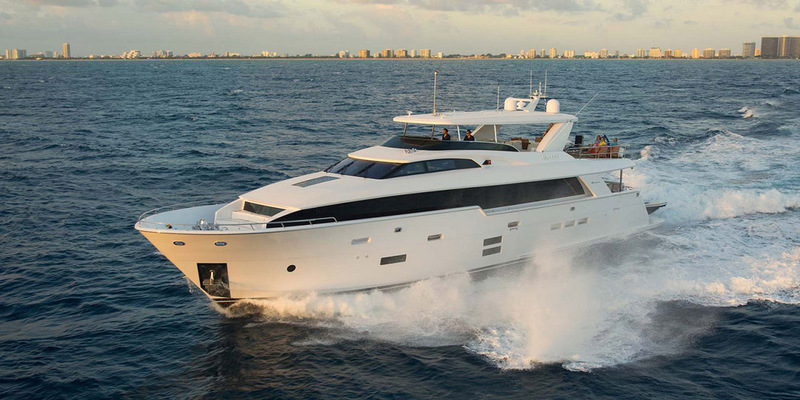 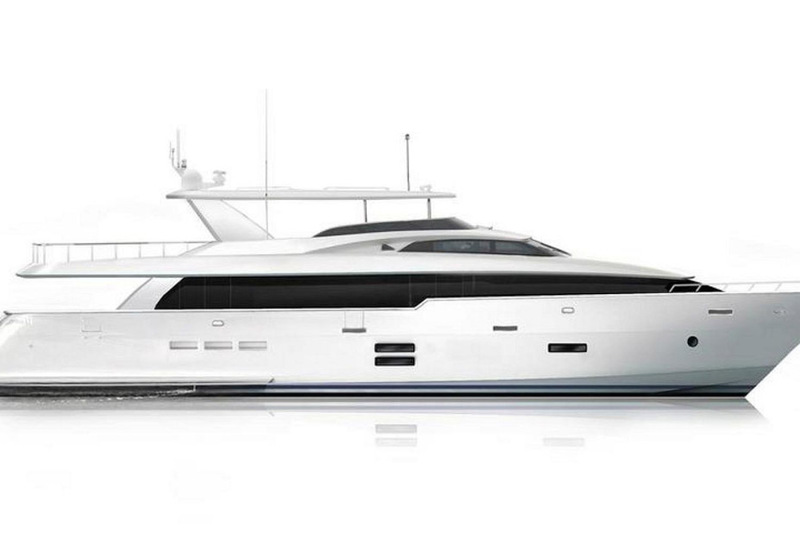 Contact your United Yacht Sales Professional today for more information on the new Hatteras Yachts M75 Panacera.